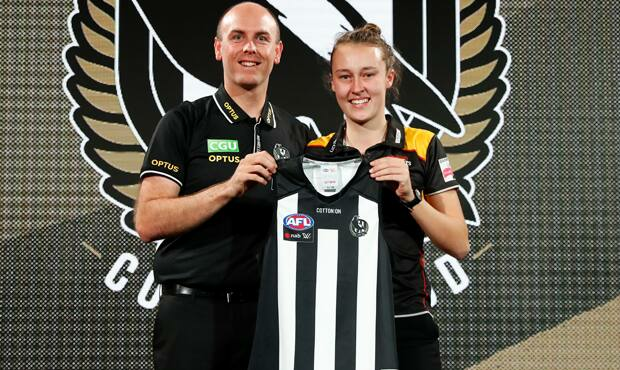 Coach Wayne Siekman presents Jordyn Allen with her Collingwood jumper after the club selected her with its first pick in the 2018 AFL Women's Draft. The 2018 AFL Women's Draft was held on Tuesday afternoon at Marvel Stadium (Docklands). Collingwood chose nine new players as its list for the 2019 season takes shape. Learn about each new recruit by viewing the biographies and photos below. Bio: A member of the AFL Women's Academy. A medium defender / midfielder with neat skills and an excellent decision-maker under pressure. A strong leader, Allen captained Vic Country in the 2018 AFL Women's Under-18 Championships. Jordyn Allen was selected with pick No. 5 in the 2018 AFL Women's Draft. Bio: A tall forward / midfielder who has excellent game sense and clean hands. Strong overhead and dangerous around goal, Lynch had an outstanding AFL Women's Under-18 Championship series this year for Vic Metro, winning All-Australian honours. Katie Lynch was selected with pick No. 11 in the 2018 AFL Women's Draft. Bio: A very competitive midfielder who wins her own ball and plays with zest and passion. Her elite running allows her to create numbers around the contest and transition both ways. Coach Wayne Siekman says: “A strong and aggressive midfielder who has been nicknamed ‘The Bull’ by her teammates. Mikayla loves the contest ball and hates to get beaten. She is very physical and you will know if you have played against her. She tackles extremely well and for a player who is only in her first year of footy, the future is exciting. Mikayla also played in Hawthorn’s VFL Women's premiership last month." Mikaya Cann was selected with pick No. 13 in the 2018 AFL Women's Draft. Bio: An athletic defender who has the ability to play one-on-one. Butler grew in confidence playing for Vic Country this year, reading the angles well with her intercept marking. Coach Wayne Siekman says: “A very versatile player who generally played down back for Vic Country but had stints in the midfield and also got a chance to play forward in the VFL Women's league this year. She has elite kicking skills on both sides of her body and is hard working. She will keep grinding all day and nothing is overwhelming for her." Lauren Butler was selected with pick No. 13 in the 2018 AFL Women's Draft. Bio: Identified by Melbourne during a club talent search camp. Previously in the Greater Western Sydney Academy, Shevlin is a very versatile player. Coach Wayne Siekman says: “A mature age player who was on Melbourne’s rookie list in 2018. She has only been playing football for 12 months and the improvements she has made throughout the VFLW season has been incredible. Her run and carry has been an asset to her game and she now has the skills to play at AFLW level." Maddie Shevlin was selected with pick No. 19 in the 2018 AFL Women's Draft. Bio: A former basketballer with the Ballarat Rush, Alexander joined Collingwood after a successful first season with the Eastern Devils in 2017. Considered unlucky to miss an AFLW Draft call up last year, the forward was picked alongside teammate Sarah D’Arcy in the 2018 VFLW Team of the Year. Coach Wayne Siekman says: “Sophie is a key forward in our VFL Women's program, and in a similar fashion to the father-daughter rule, where other clubs could bid on her and we then had to take her with our next pick in the middle of the third round." Sophie Alexander was selected with pick No. 29 in the 2018 AFL Women's Draft. Bio: Injuries have been cruel to the 19-year-old who has undergone two knee reconstructions in recent years. Gourlay bounced back hard at the end of the 2018 VFL Women's season and has plenty to offer as an AFL Women's player. Coach Wayne Siekman says: “A fantastic story. At 19, she has come back from two knee reconstructions in 2015 and 2016 and proved at the back end of the VFLW season that she hasn’t lost her talent. One of the best kicks seen in the Vic Metro side during her time in the Under 18’s, Gourlay has great game sense and can play off half back or on the wing. She is a fantastic person with great resilience." Georgia Gourlay was selected with pick No. 32 in the 2018 AFL Women's Draft. Bio: Born on New Year's Day in 1996, Membrey played five games for the Brisbane Lions in the inaugural AFL Women's season before being delisted after the Grand Final. She spent 2018 working with Gold Coast and is now set to get another opportunity. Coach Wayne Siekman says: “Jordan played for the Brisbane Lions in 2017 including their Grand Final before being delisted. She is 22 and has continued to work hard and improve her game. This year she captained Gold Coast in the winter series where she got to show off her talents. A powerful kick who has a great pair of hands and can play both forward and in the midfield." Jordan Membrey was selected with pick No. 50 in the 2018 AFL Women's Draft. Bio: Standing at 180cm tall, Fowler will provide an aerial target in the forward line with the ability to assist Eliza Hynes with ruck duties. A talented athlete, the 26-year-old also represents the University of Queensland in the Aon Uni 7s Series. Coach Wayne Siekman says: “Erica played for our VFLW team this year as a Queenslander. She flew herself down every couple of weeks off her own bat to improve and try and get the best out of it. It’s worthwhile for her and it’s paid off. She’s a forward-ruck which helps Eliza Hynes." Erica Fowler was selected with pick No. 68 in the 2018 AFL Women's Draft.